Rivers Edge Golf Club is one of the most stunning golf courses on the Grand Strand. The course reflects the humble nature of its designer, Arnold Palmer, and his love for the beauty of nature. Perhaps one of the loveliest courses of all, Rivers Edge presents all the uniqueness a course can muster. Pleasantly challenging and yet just as relaxing, from the moment golfers step foot on the course, it is like stepping foot into another dimension because of the serene calm, quiet and uninhibited space that surrounds. Six of the course holes rest upon high bluff areas, allowing golfers a moment to stop and look around at expansive surround of impressive marshland. Gazing out along the Shallotte River is irresistible and breathtaking. Players cannot help but take a pause to absorb the picturesque sight that lies before them. Plenty of strategic bends, undulating fairways, and cleverly placed freshwater lakes create an unforgettable challenge that entices even the most avid player to give it a go. There is no other course on the Grand Strand that compares to this Palmer design. Ranked as one of the top 5 courses in North Carolina and rated #62 on a list of top 100 courses in America, this course provides plenty of astounding gameplay and amenities that keep players repeatedly coming back for more. 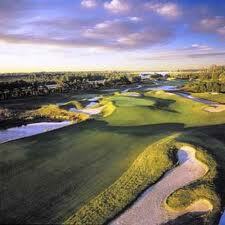 In 2010, Rivers Edge was observed as one of "The Best Courses near You". Noted by many famous publications such as Golf Magazine and golf Digest has brought in considerable attention from golfers worldwide. This golf course is CLOSED and will reopen September 1, 2015. Rivers Edge Golf Club is one of the most stunning golf courses on the Grand Strand.